Connecting my Bluz DK to Blynk was something I wanted to do for a while. There are no libraries available, at least as far as I know (here and here). However, there are great libraries for Particle Photons (and soooo many other microcontrollers). What are we going to build here? We are going to build a Blynk app that will display data from a Bluz DK. As a secondary goal, we will turn on and off an LED with a Blynk button. The Blynk libraries take care of connecting our micro controllers to the Blynk cloud (or the Blynk Server in the picture below). Once the connection is done, we can access data from that micro controller on a Blynk app on our phones (or tablets). We can also control pins or trigger actions from buttons in the Blynk app. But where? Since there are no libraries for our cherished Bluz DK, what would happen if we installed the Blynk libraries in our Particle Photon instead? I will tell you what would happen: we would end up with a Bluz Gateway that can run Blynk and that's it. Let's call it Bluz-Blynk Gateway just for fun. So, is this new Bluz-Blynk Gateway aware of the variables, data or functions in our Bluz DK? No, it isn't. The Gateway just passes information through from BLE (Bluetooth Low Energy) to WiFi, but it knows nothing about that information. I cannot install the Blynk libraries on my Bluz DK and the Gateway is not aware of the data on my Bluz DK. There is a publish-subscribe functionality on the Particle Cloud that allows us to pass information around our Particle hardware. The publish sends an event to the cloud, to which we can subscribe from another Particle microcontroller. And even better, this event can contain some data. Since Bluz DK is part of the Particle family, we can use this events mechanism to pass data from it to the Photon and back. getRemoteTemp is a function that will get called when the event is received, so we will need to declare it in our firmware. Our project will have a Blynk app running in our phones/tablets. This app will talk to the Blynk libraries installed in the Photon in the Bluz-Blynk Gateway. Finally, the Photon will use events to transmit information back and forth to our Bluz DK. Remember: you need to get an Auth Token for your Blynk app and paste it in the firmware, more info here. In this firmware we need to read the thermistor and send an event with that value. We will need to subscribe to an event that will be triggered from the Photon when we hit the button in our app. Here we need to write virtual pin V0 and read virtual pin V1. V0 will contain the temperature sent in the event coming from the Bluz DK. When we tap the Blynk button in our app, an event will be triggered, the Bluz DK will receive it and it will turn on the onboard LED. Never used virtual pins before? No worries, read here about how they work. Once everything is set up and flashed, the project is ready! Check the temperature and how tapping the button turns on the Bluz onboard LED! There is A LOT going on in this project, and of course Murphy's law dictate that anything that can go wrong will go wrong, so don't lose your hope when you hit trouble. 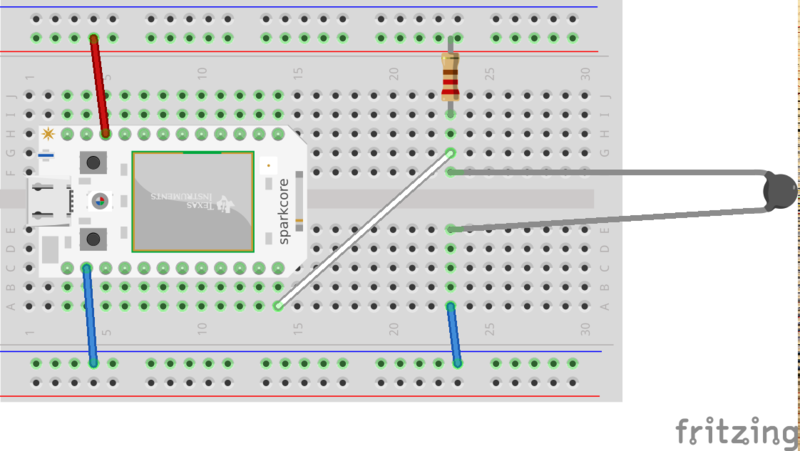 Have in mind that this project is based on my previous Bluz wireless temperature sensor project, so if something is not explained here, it might be that is explained there. If not, ask in the comments below. It always helps having strong communities. The bluz community is here, the Particle community is here and the Blynk community here. Check the rest of my projects here! // This is a human-readable summary of (and not a substitute for) the license. // The licensor cannot revoke these freedoms as long as you follow the license terms. // Attribution — You must give appropriate credit, provide a link to the license, and indicate if changes were made. You may do so in any reasonable manner, but not in any way that suggests the licensor endorses you or your use. // NonCommercial — You may not use the material for commercial purposes. // ShareAlike — If you remix, transform, or build upon the material, you must distribute your contributions under the same license as the original. // No additional restrictions — You may not apply legal terms or technological measures that legally restrict others from doing anything the license permits. // You do not have to comply with the license for elements of the material in the public domain or where your use is permitted by an applicable exception or limitation. // No warranties are given. The license may not give you all of the permissions necessary for your intended use. For example, other rights such as publicity, privacy, or moral rights may limit how you use the material. // Free for personal use. // A7 is not available in bluz! // A6 and A7 cannot read analog data even though they are still labeled A6 and A7 (which was done for compatible code). There simple weren't enough ADC pins on the nrf51.